Sometimes referred to as Quinke's Edema, angioedema is that swelling we see that is most apparent around the mucosal areas of the face. Consider Hives as swelling on the surface of the skin, and angioedema as swelling beneath the skin. The most common cause of this type of swelling without the presence of Hives is hypersensitivity to ACE inhibitors. ACE = Angiotensin converting enzyme. This converts angiotensin one into angiotensin two. Bradykinin is a peptide that has a role with all forms of angioedema. It is a potent vasodilator that increases permeability and allows the accumulation of fluid within the interstitial space. ACE is one of the main ways that bradykinin is degraded. So when we inhibit the production of ACE, we are then inhibiting the degradation of bradykinin. We then have this run away peptide and subsequent swelling. 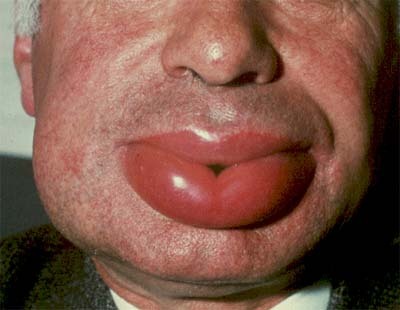 Many patients that suddenly present with severe angioedema have been taking ACE inhibitors, such as lisinopril, for a long period of time. They may have never had any issues before, but out of no where have this severe reaction. This type of reaction is most common in the African-American population, but may occur in anyone. There are other types of angioedema, including the traditional allergic reaction. Those are more well known and prepared for. As you can see from the pictures above, swelling may be within the oropharynx. This can cause an airway obstruction, and aggressive airway management should be advocated. This patients may be obtunded and snoring as you enter the scene. They have been confused for diabetics, or acute coronary syndrome patients due to their initial impression. It is common for these patients to undergo cricothyrotomy due to complete glottic obstruction. Moving quickly is imperative to prevent severe hypoxia and cardiorespiratory arrest. The usual drugs used for anaphylactic reactions are indicated. - Epinephrine to reduce the vasodilation. So the next time you run on a patient that is presenting with swelling in the absence of hives, think angioedema, and act fast! I just encountered this for the first time on Friday. I could swear the first picture was our patient's face. The physician at the clinic did not even mention this as a possibility...he attributed it to a new eye drop the patient was taking. 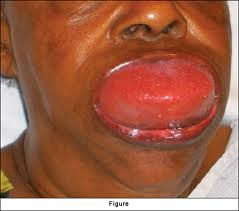 The ER doctor mentioned angioedema, said it was common with lisinopril and no more explanation as he walked away. I wish I had this patient after reading and learning about this, I could have directly credited Paramedicine 101 with a "save". Thanks again for the information...thanks for EMS 2.0! I'm glad I could elaborate a little on the condition for you. They can be pretty scary calls. I've run maybe a dozen of these calls over the years. I missed the diagnosis on the very first and very last ones. The first one, I was a brand-new medic who had never heard of angioedema, but I gave it epi and Benadryl for lack of something better to do. When I got to the ED, the doc educated me on the condition and what causes it. The last one was barely a month ago, and I missed it totally. 64-year-old woman says she can't breathe, and presents with acute dysphagia. I look at the back of her throat, and it's grossly swollen, but not at all erythematous. Otherwise she was fine, and we were only a couple of blocks from the hospital, so we just transported. ED doc knew what it was from the first moment he saw it, and I felt like a chump for having missed it. I had never before encountered a patient that early in the process, before gross swelling had begun. Kelly, without those humble moments we would learn nothing. Thanks for sharing man. Great post on a rare condition. The one thing I have been taught as an EM resident (former EMT-B) is that epi and steroids are indicated but not effective. So don't waste time with getting an IV in a clamped down patient- if they are not maintaining an airway you need to go right to cric. People have claimed success in the past with orotracheal intubation but I would only do it if you have two experienced providers- one to take a look and the other prepping the neck for a cric. If they are maintaining an airway, transport them in whatever position they want to be in and try the meds. The definitive treatment is C1 esterase which is only found at the hospital. An early heads up to the ER may be helpful in getting this rare medication from the pharmacy/blood bank before the patient arrives. Really great post- its a zebra that can cause that instant pucker factor.